Lavishly illustrated with photos, the book features a series of essays by a variety of people intimately familiar with the Project. Contributors include former Detroit director of cultural affairs Marilyn Wheaton; the late Detroit Free Press publisher Neal Shine; and Guyton himself. 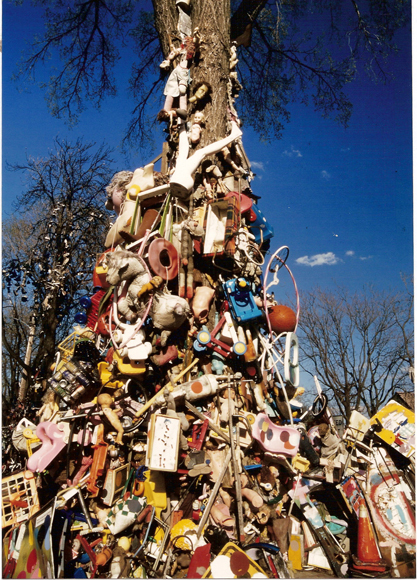 In its twenty years of existence, the Heidelberg Project has inspired awe in visitors from around the world, drawn praise from the international art community, and provoked extensive discussions in its own backyard. In 1986, Tyree Guyton created the project with the idea of visibly transforming the environment of his decaying neighborhood, which was marred by crime, prostitution, and gangs. 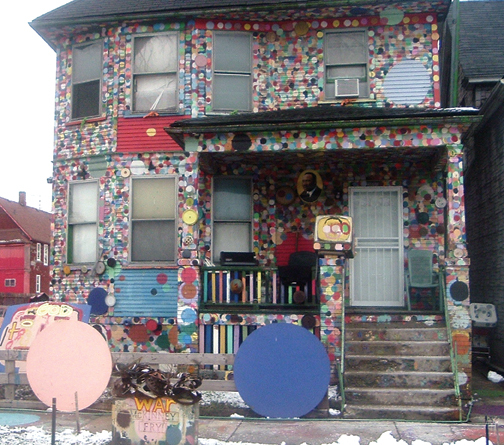 Using the materials around him—cast-off toys, discarded car parts, and other debris—along with his trademark brightly colored polka dots, Guyton eventually transformed several houses and vacant lots on Heidelberg Street into the city's most recognizable art environment and one of its leading tourist attractions. Connecting the Dots, the first comprehensive collection of writings on the Heidelberg Project, attempts to get to the heart of Guyton's project by considering it from a number of fascinating angles—including legal, aesthetic, political, and personal. Because of its unorthodox nature and large scope, Guyton's art has often met fierce opposition in his own neighborhood while garnering raves from around the world. Connecting the Dots explores this tension in "Art or Eyesore?" by landscape architecture expert and Harvard lecturer John Beardsley and in Detroit News reporter Michael Hodges's essay, "Heidelberg and the Community." Former Detroit Free Press editor and publisher Neal Shine adds a piece on Sam Mackey, Guyton's grandfather and the artist's inspiration for the project. In addition, a complete legal perspective on the Heidelberg Project is presented by attorney Daniel S. Hoops, and the city's position on the project is explained by Marilyn Wheaton, former director of Detroit's Cultural Affairs Department. Wayne State University professor of art history Marion E. Jackson also offers an aesthetic analysis of Guyton's project, and Detroit native Aku Kadogo discusses bringing Guyton and his project to Sydney, Australia. Connecting the Dots concludes with an "inside view" of the Heidelberg Project in a piece by Jenenne Whitfield, the project's executive director. Connecting the Dots presents these essays along with a thoughtful introduction by Wayne State University professor of English Jerry Herron and an artist's statement by Tyree Guyton. Numerous photographs of Guyton's artwork are also included in this full-color oversized volume. Artists, art historians, and those interested in Detroit cultural affairs will enjoy this comprehensive and intriguing book. 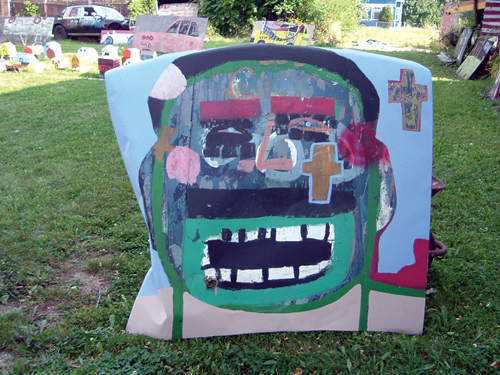 The Heidelberg Project raises issues of art, politics, community development, underdevelopment, conflict, anger, and love. Connecting the Dots does a fine job of presenting this complexity with care and objectivity. The essays in Connecting the Dots are intelligent and varied. Illuminated by their viewpoints, Guyton's Heidelberg Project shines like a jewel in the still-wounded city. Lavishly illustrated with photos, the book features a series of essays by a variety of people intimately familiar with the Project. Contributors include former Detroit director of cultural affairs Marilyn Wheaton; the late Detroit Free Press publisher Neal Shine; and Guyton himself." This [Heidelberg] Project is a whole lot of things all at once-legal tangles and art-historical squabbles, neighborhood battles and demolitions, spiritual journeys and catfights, 'art' maybe, and life, surely life, that this project forces to an intensity that, regardless of one's view, is impossible not admire. That's the conflicted route, maybe the only route, that will really get you to Heidelberg Street. A remarkable story of an artist's quest to transform his urban neighborhood, Connecting the Dots explores Tyree Guyton's journey as an artist and his impact on his Heidelberg Street neighborhood in Detroit. The book covers the controversies surrounding the project, the hopes of the artist, and a glimpse at the plans for the future." Full color photographs illustrate this amazing tour of the power of art and one man's dedication to peacefully fight for a better neighborhood. Highly recommended as an inspirational addition to both public library and private art book collection." The impact of the many full colour images is heightened courtesy of the book's generous dimensions. Connecting the Dots is a particularly cohesive publication, successfully echoing the collaborative nature of The Heidelberg Project." 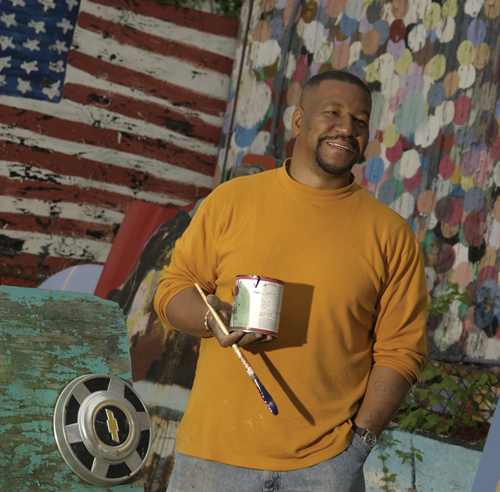 A remarkable story of an artist's quest to transform his urban neighborhood, Connecting the Dots explores both the beginning of Tyree Guyton's journey as an artist and his impact on his Heidelberg Street neighborhood in Detroit. The book covers the controversies surrounding the project, the hopes of the artist, and a glimpse at the plan for the future." Connecting the Dots nevertheless does an adequate job of fleshing out the history and circumstance that help define two decades of Guyton's practice, looking at it first and foremost from a community perspective. The full-colour photographs included throughout this publication present a variety of site-specific images, including a spectacular bird's eye view of the Heidelberg block that makes the neighborhood seem lush and green, despite its reality as an urban environment in constant struggle."